Tata Tiago comes with a multifunctional steering wheel with tilt adjust feature. Controls for the music system are placed on the steering wheel so that the driver remained focussed on driving while browsing through the music playlist on the go. This ensures road safety while driving. 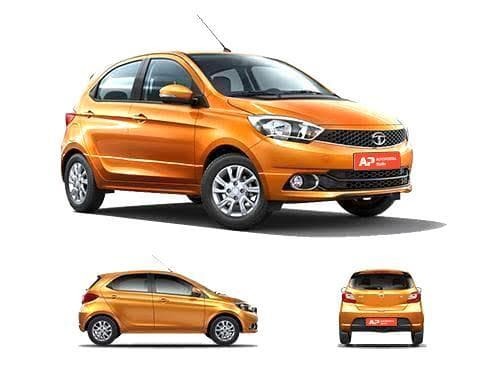 The variants of Tata Tiago that offer steering mounted controls as standard include JTP, Revotorq XZ, Revotorq XZ Plus, Revotorq XZ Plus Dual Tone, Revotorq XZ w/o Alloy, Revotron XZ, Revotron XZ AMT, Revotron XZ Plus, Revotron XZ Plus Dual Tone, Revotron XZ w/o Alloy. The variants of Tata Tiago that do not offer steering mounted controls as standard include Revotorq XB, Revotorq XE, Revotorq XE(O), Revotorq XM, Revotorq XM(O), Revotorq XT, Revotorq XT(O), Revotron XB, Revotron XE, Revotron XE(O), Revotron XM, Revotron XM(O), Revotron XT, Revotron XT(O), Revotron XTA, Wizz Edition Diesel, Wizz Edition Petrol.